Jellystone Park is on high alert: tourists are flocking to Jellystone's Picnic Rock and aliens are close behind! In a fabulous feature-length adventure, Yogi and Boo Boo are beamed up to a spaceship and alien invaders send clones of our two heroes, called Duploids, back to Earth in their place. Hopefully Yogi and Boo Boo can make it off the ship, back in time to save Jellystone from Duploid destru… ction. 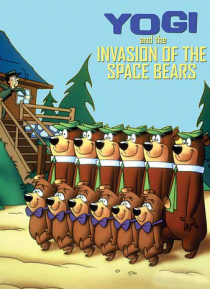 For fantastic family fun, let Yogi & the Invasion of the Space Bears take over your house.